As the world faces a multitude of complexly-interwoven challenges, new values and new worldviews are emerging to change the ways in which human beings relate to each other, to our planet, and to all life on Earth. In today's globalized world, humanity is becoming inescapably aware that coexistence, cooperation, and respect for diversity are fundamental values by which all of us must live. These essential human values, which apply in all individual and societal relationships, are likewise intrinsic to a culture of peace: a way of living that will allow a harmonious, multifaceted, global civilization to blossom.Central to this volume is a belief that in an interdependent world, collective decision-making for the collective good is the most effective way to move forward. In order to respect the balance among cultures and nations, decisions that have a global impact must be taken multilaterally. 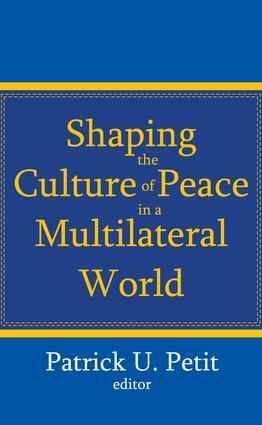 No culture can achieve and maintain its international objectives by acting unilaterally; nor can any nation or cultural group claim to represent the whole of humanity.Shaping the Culture of Peace in a Multilateral World compiles prominent visionary articles from United Nations institutions and regional and other intergovernmental organizations, and highlights the contributions being made to the creation of a culture of peace. It aims to strengthen multilateral cooperation among intergovernmental organizations worldwide, and to facilitate the formation of a global network of multilateral mechanisms, which will provide collective and holistic responses to the peace and security challenges of the 21st century. Shaping the Culture of Peace in a Multilateral World is in itself a true example of multilateralism, and a publication treasure for people, who are active or interested in international diplomacy and international affairs.